Private OPRA requests are here! We are pleased to announce that you can now file private OPRA requests using OPRAmachine! 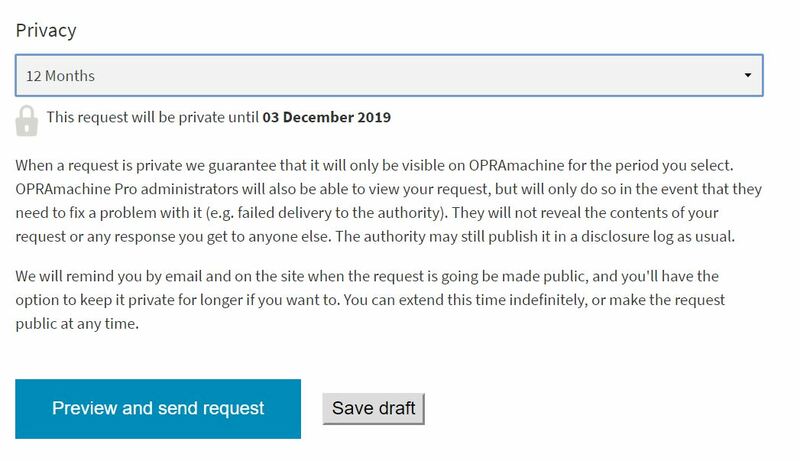 Private OPRA requests can be filed with public agencies if you have an OPRAmachine Pro subscription. With a Pro subscription, you can keep your OPRA requests and documents private, so they won’t show up on the site or in search engines. This feature is geared toward companies and individuals who use OPRAmachine in a professional capacity, such as law firms, private investigators and corporate users. You’ll find OPRAmachine Pro’s features useful if you are an attorney making requests on behalf of your clients or a high-volume requestor that needs to make OPRA requests beyond the limit imposed by free accounts. Your Pro subscription includes unlimited OPRA requests and a special dashboard exclusive to Pro users that helps you streamline the entire public records request process. Pro accounts help us fund additional server infrastructure so we can continue to deliver the excellent level of service that our users have come to expect. Filing a public OPRA request on OPRAmachine will always be free. We will also be supporting batch OPRA requests at a later date. Due to a technical issue we have had to delay the implementation of this feature.